Drunk driving is a serious problem in this country, and several campaigns from the federal government and non-profit organizations are aimed at curbing the behavior. Almost all of the tactics used include a heavy dose of shame, from Helen Mirren calling drunk drivers stupid to ads that make drinkers feel guilty for potentially leaving their pets sad and alone if they don’t make it back to the house. If that is not enough to make you rethink getting behind the wheel after a few drinks, consider that your car might be turned into cautionary coasters when you inevitably total it. I don’t mean to sound unfeeling when I talk about drunk driving, but those collisions and injuries are completely avoidable thanks to designated drivers and taxis, as well as more recent innovations like ride-sharing apps. Please, if you don’t want your life, your car, or the lives of other people on the road to become the next cautionary tale told to bar patrons or teens preparing for prom, stay away from the steering wheel when you have been drinking. 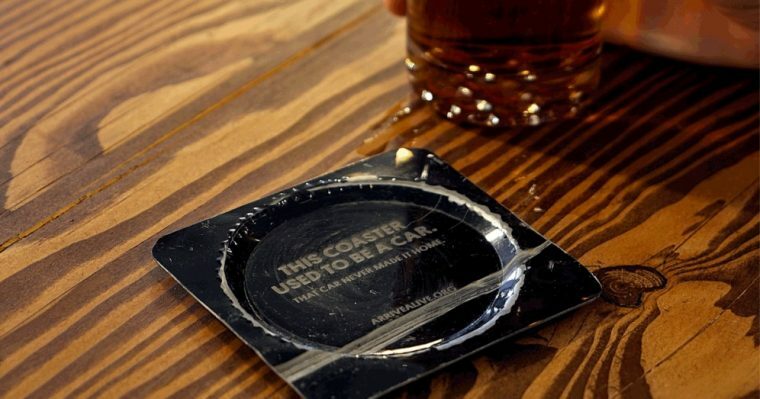 None of us want to recognize your paint color on a coaster.